Why Bother With a Shareholder Letter? How well a CEO tells the narrative of their company actually impacts the stock price. 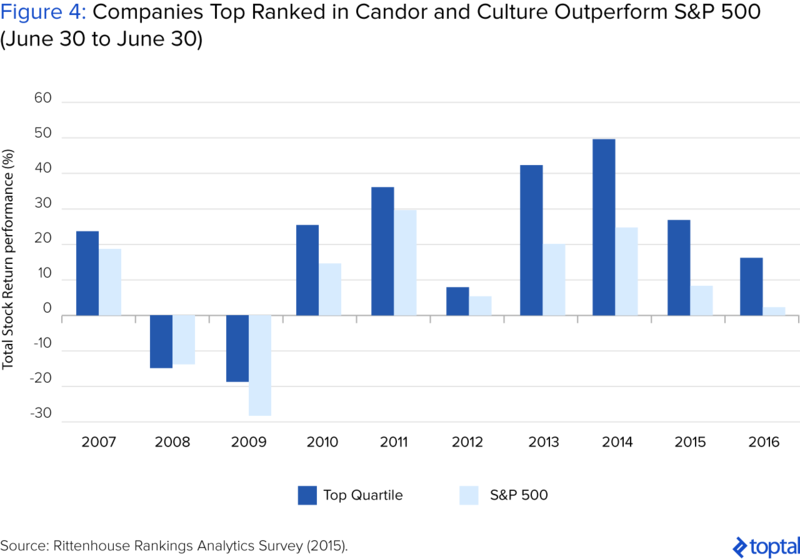 A study published by Rittenhouse Rankings showed that the average price change for companies in the top quartile of its Candor & Culture Analytics Survey from 2007 to 2015 outperformed the S&P 500 in every one of the past ten years. Standard & Poor's found in a landmark study that leaders who communicated candidly and with utmost transparency in annual reports had a high correlation with a lower cost of capital and superior financial performance. Approximately 37% of equity investment is still done by households or non-institutional entities that must do their equity research the old-fashioned way. Therefore, it is in management's best interest to make their story easily told and understood. There's a reason everybody reads Buffett and Bezos—they give insight into interesting financial concepts, economic outlooks, managerial insight that is far ahead of anything being taught in business school, and more. This sort of outside-the-box thinking automatically confers greater credibility and following. 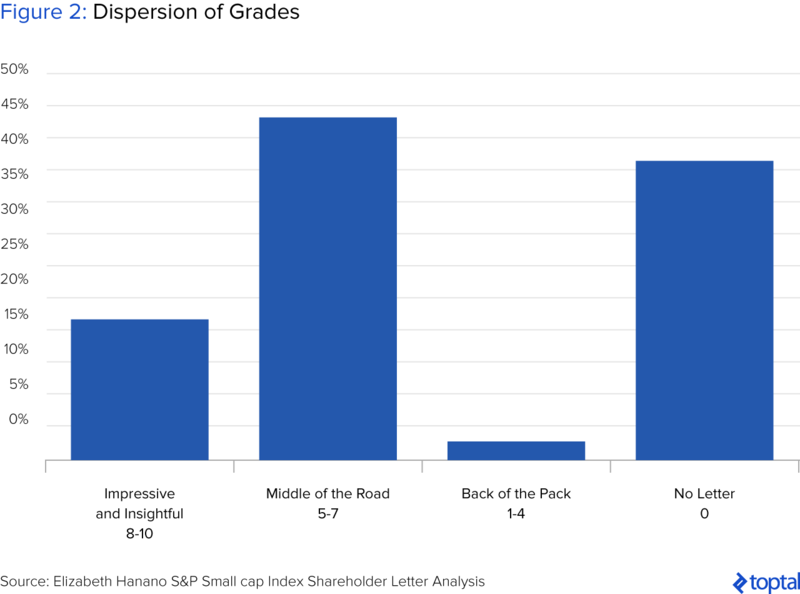 All the available shareholder letters in the S&P SmallCap 600 Index were analyzed in search of some lesser known gems and to extract examples of what the traits of the best shareholder letters were. These were graded on a rubric from 1-10 (1 being lowest, 10 being highest) based on the author's own knowledge, the best traits from the Berkshire Hathaway letters as per HBR, and the Rittenhouse Rankings' CEO Candor & Culture Survey. All of the criteria were boiled down into five categories: (1) Define the Company and Its Strategy, (2) Be Candid, (3) Educate, (4) Tell a Story (the Investment Thesis Story), and (5) Entertain. Companies with the best shareholder letters outperformed the Index. Those companies that received a "10" rating significantly outperformed the S&P SmallCap 600 on a 1-year, 3-year, and 5-year basis. Only 3% of letters are worth reading. Most companies received a Middle of the Road grade (43%) while a very small percentage scored in the Back of the Pack. About 17% scored in the Impressive and Insightful range and just 3% were considered Must Reads (A rating of "10"). Many companies choose not to even write a shareholder letter. Approximately 37% of companies in the SmallCap 600 Index had no shareholder letter or at least one that was readily findable. Of those 37% without letters, the biggest abstainer industry was telecom followed by healthcare and consumer discretionary. The biggest participant industry was utilities (although this was a small sample size), followed by consumer staples and energy. Interestingly, there was no statistically significant difference between the stock performance of those companies with a shareholder letter versus those without one. Define the company and its strategy: Good shareholder letters spell out who they are and what their vision is for the company over the long term. This instills trust in stakeholders and provides a level of cushion when a seemingly out-of-character decision is made. Good shareholders invest in companies with big picture visions they believe in. Be candid: The importance of candor is clearly shown in a simple analysis of the Rittenhouse Candor & Culture rankings of four banks from 2002-2012: Wells Fargo, Bank of America, Wachovia and Merrill Lynch. Wells Fargo's ranking remained consistently at the top and while Bank of America's was lower, it was still in the middle of the pack back during the financial crisis. Those whose Candor & Culture rankings were the lowest—Wachovia and Merrill Lynch—did not survive the economic crisis. Educate: At the very least, management teams should want the investor to walk away from the letter more informed about its industry and company. Tell a story: Verbally, an analyst has about 60 seconds to get a portfolio manager's attention. The easier a management team makes it to retell an investment thesis, the better institutional salespeople will retell the story, the more analysts will pitch to their portfolio managers, and the more retail investors will pitch to their friends at dinner. Entertain: By far, the most entertaining letters possess all the traits listed above (define the company, tell a story, be candid, educate) but when that was all done in a compelling and plainly written way—free of jargon and meaningless corporate phrases—those were truly a joy to read. Equity analysts often leave out an important source of wisdom when analyzing companies—the annual shareholder letter. 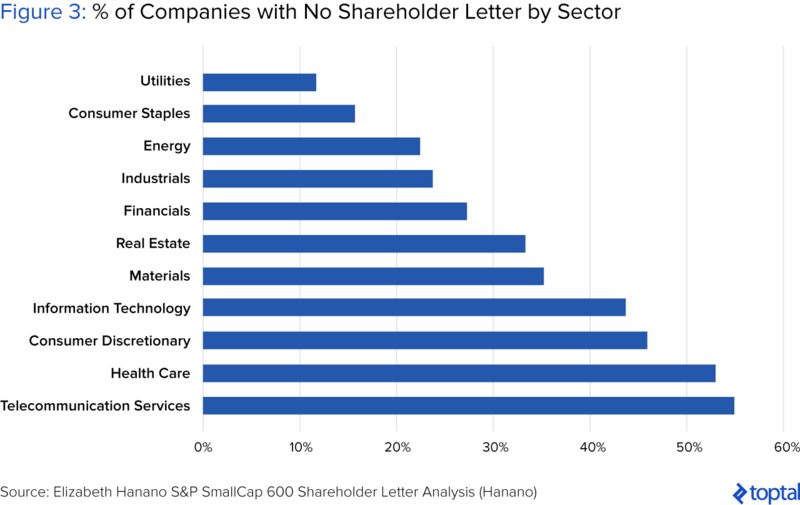 This article intends to elucidate the purpose and traits of good shareholder letters based on an analysis of the 601 companies in the S&P SmallCap 600 Index. The article will also direct readers to some of the best lesser-known shareholder letters to put on their annual reading list. As an equity analyst, I’ve spent years refining my investment process. When I first started ten years ago, I had no process. I knew all the things I wanted to get done to understand a company, but the method was similar to the segment on Jimmy Fallon’s show where he puts out two bowls of dog food and lets ten puppies loose—where those puppies go is chaos and unpredictable. One of the items I recently added to the investment checklist is something many equate to reading the dictionary—reading shareholder letters. One of the major factors in investing is the strength of the management team. Do I want to partner with these people? Do I believe they will execute in favor of improving economic returns to shareholders over the long term? I’ve found that a shortcut to assessing a management team can be found in a shareholder letter. While most are simply a chest-beating, laundry list of accomplishments (no matter how poor the stock price performance was), some leaders take the task seriously and use the letter as a time to reflect on the year that was and remind investors and their team where they see the future of the company. As part of the research for this article, I read all the available shareholder letters in the S&P SmallCap 600 Index in search of some lesser known gems and to extract examples of what I believe makes a great shareholder letter. First, I’ll tell you the methodology of my study, and then we’ll review the traits of a great shareholder letter and finally (and most exciting), we’ll take a look at some of the lesser-known greats that I discovered during my research. Why the SmallCap 600 Index? With a stock, once pertinent information becomes public, the stock price reflects the entirety of that information. So goes shareholder letter wisdom. Everyone knows the Bezos and Buffet and Dimon letters while the currently smaller (but rapidly growing) smaller cap wisdom seems to go unread and unlearned. This is a chance to get an edge on the competition. Additionally, smaller companies tend to be younger, running faster and hungrier, in my opinion, and my hope was to find a bit more enthusiasm and candor than one might find from a 50-year old, $10 billion+ market cap company. How Do You Find a Shareholder Letter? For reference, all 601 S&P SmallCap Index companies were reviewed for annual shareholder letters. Only about 63% of the Index published a shareholder letter, or at least one that was readily findable. I allotted about two minutes of search time to finding each letter. Search methods included Googling the company’s name + “Annual Letter,” the company’s name + “Shareholder Letter,” the company’s name + “Annual Report,” and going to the company’s investor relations page and searching there. I also used AnnualReports.com, which does a great job of amalgamating recent annual reports, however; many companies are not available on that website. As far as I can tell, there is no simple way to search for them. The SEC’s EDGAR website allows you to search “ARS,” which will tell you when the last annual report (annual reports include the shareholder letter, unlike 10-Ks) was filed—however, it often doesn’t include the actual document. How Were the Companies Assessed? I read the 377 companies that published readily available shareholder letters and graded them on a rubric from 1-10 (1 being lowest, 10 being highest) which was based on my own knowledge, the best traits from the Berkshire Hathaway letters as per HBR as well as the Rittenhouse Rankings’ CEO Candor & Culture Survey. I boiled down all of our criteria into five categories: (1) Define the Company and Its Strategy, (2) Be Candid, (3) Educate, (4) Tell a Story (the Investment Thesis Story), and (5) Entertain. Impressive and Insightful (8-10): If a company did at least two elements of the “Best Traits” or if they did one element extraordinarily well. Back of the Pack (1-4): If a company did none of the “Best Traits” or did a “No-No” (e.g., wildly congratulate its own management team or turn a financial statement into words). 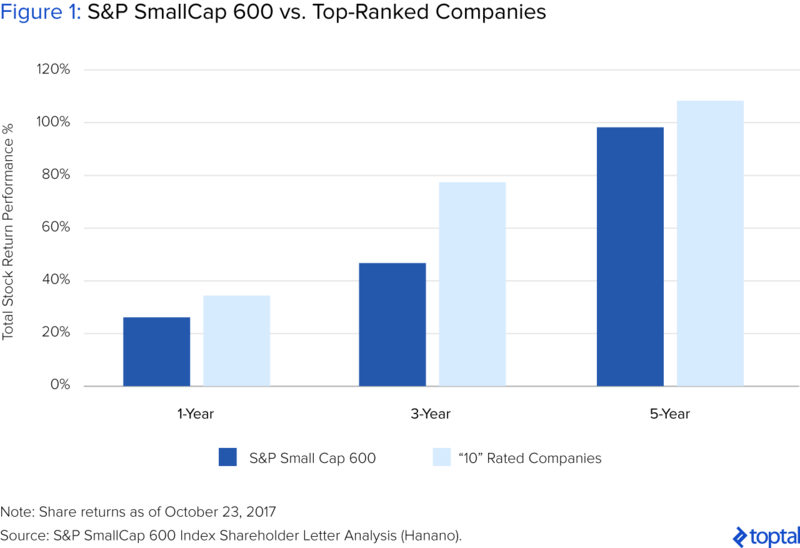 As shown in Figure 1, those companies that received a “10” rating significantly outperformed the S&P SmallCap 600 on a 1-year, 3-year, and 5-year basis. This finding makes it clear that reading shareholder letters truly is an important part of the investment process. This finding was also uncovered in the Rittenhouse Rankings CEO Candor & Culture Survey as well as Standard & Poor’s study which are both discussed further below. Most companies received a Middle of the Road grade (43%) while a very small percentage scored in the Back of the Pack as that grade was reserved for the letters that truly made me feel like I wasted time or someone was trying to take shareholders for fools (“We’re so great!” Meanwhile their stock is down 50%…). About 17% scored in the Impressive and Insightful range and just 3% were considered Must Reads (A rating of “10”). Approximately 37% of companies in the SmallCap 600 Index had no shareholder letter or at least one that was readily findable. “Readily findable” means it could not be reasonably found in two minutes of searching via the process described in the section above, “How to Find a Shareholder Letter.” Of those 37% without letters, the biggest abstainer industry was telecom followed by healthcare and consumer discretionary. The biggest participant industry was utilities (although this was a small sample size), followed by consumer staples and energy. Interestingly, there was no statistically significant difference between the stock performance of those companies with a shareholder letter versus those without one. Reading a shareholder letter to gain insight into corporate culture is not just a “nice-to-have” element in the investment research process. How well a CEO tells the narrative of their company actually impacts the stock price. In addition to my own study, which showed that companies with the strongest shareholder letters outperformed their index, a study published by Rittenhouse Rankings showed that the average price change for companies in the top quartile of its Candor & Culture Analytics Survey from 2007 to 2015 outperformed the S&P 500 in every one of the past ten years. Additionally, Standard & Poor’s found in a landmark study that leaders who communicated candidly and with utmost transparency in annual reports had a high correlation with a lower cost of capital and superior financial performance. With this in mind, there are a few ways to utilize shareholder letters. One way is to read them to determine if a management team is to be trusted as good stewards of capital and if they can boil that essence down into a candid, relatively short (under ten pages) shareholder letter—an elevator pitch. Another way is to soak up wisdom from great managers, regardless of one’s interest in investing in a particular stock. These are traditionally thought of as the Bezos and Buffet letters. Buy-side analysts have access to sell-side research which ordinary investors don’t have access to. In a ten-minute phone call, buy-side analysts can talk to an expert on the company and find out important qualitative traits very quickly (quality of management team, importance of “beating the numbers,” long-term strategy, capital allocation, past hiccups, investor sentiment). Good shareholder letters can democratize investors by putting much of this information in the annual shareholder letter. While investor sentiment may be the toughest to capture via a shareholder letter, addressing issues that shareholders are consistently bringing up would go a long way. 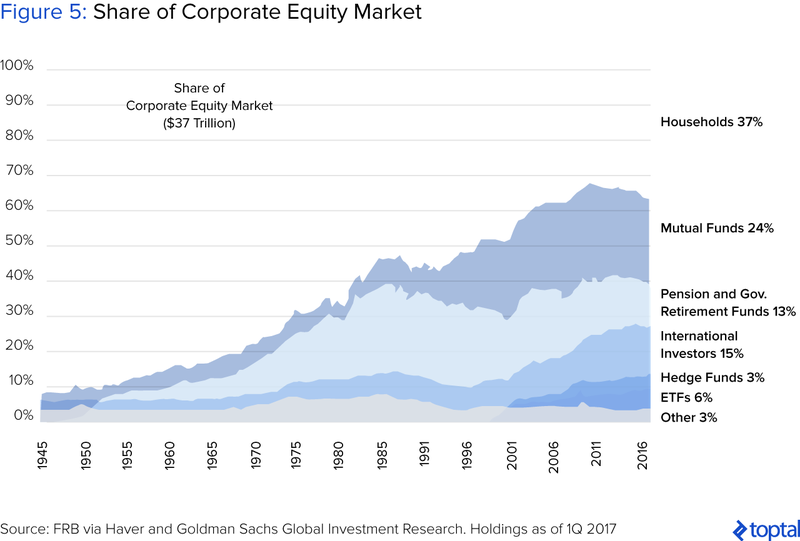 Approximately 37% of equity investment is still done by households or non-institutional entities that must do their equity research the old fashioned way—combing through SEC filings, reading press reports, listening to conference calls, reviewing investor presentations, perhaps creating their own models, etc. These people don’t have access to the written research of analysts who have studied the stock for years and play golf with the management team. Therefore, it is in management’s best interest to make their story easily told and understood. After all, nobody should be able to pitch the merits of a company better than its own leaders. The shareholder letter is a great time to get that done. There’s a reason everybody reads Buffett and Bezos—they give insight into interesting financial concepts, economic outlooks, managerial insight that is far ahead of anything being taught in business school, and more. For example, in Bezos’ most recent shareholder letter, he discussed the concept of “Disagree and Commit”—a phrase that can go a long way towards helping high-velocity companies make decisions when someone has conviction in a particular direction despite the team not being able to reach consensus. This sort of outside-the-box thinking automatically gives Bezos street cred (as if he needed more) as an outside-the-box, prudent steward of Amazon’s capital. Below is a discussion of the traits of the best shareholder letters with examples from the S&P SmallCap 600 Index. This one seems obvious but is often forgotten in lieu of getting straight to the weeds. Good shareholder letters spell out who they are and what their vision is for the company over the long term. This instills trust in stakeholders and provides a level of cushion when a seemingly out-of-character decision is made (e.g., Amazon buying Whole Foods). Good shareholders invest in companies with big picture visions they believe in. A method that works quite well is something that Strayer does. 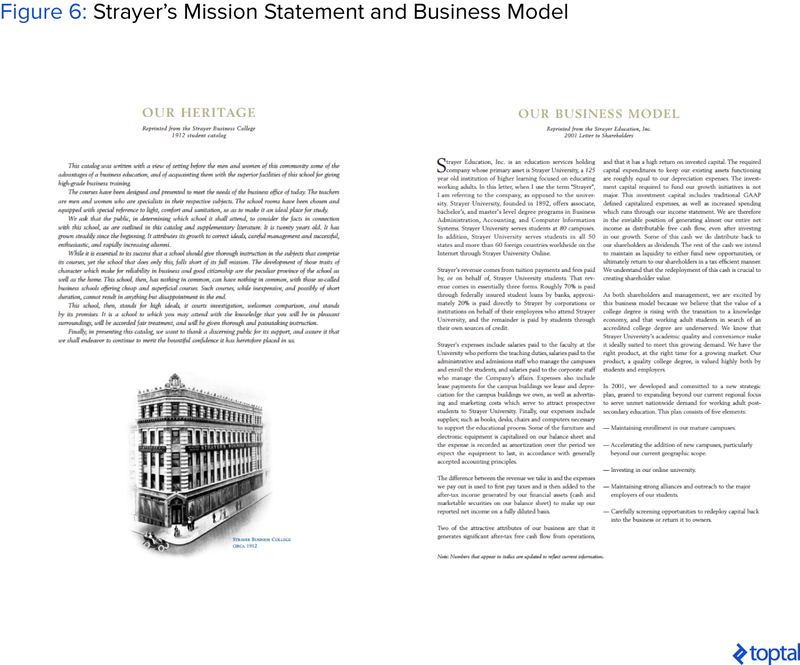 They have one page that shows their mission from 1912 which instills the reader with a sense of the company’s culture. The second page is the letter to shareholders from 2011, which essentially explains the business model, drivers, and investment thesis over the long term. Next, Strayer has its current annual shareholder letter, which dives into more specifics from the year. For someone who has never looked at an educational company and is new to Strayer itself, the first two documents provided are quite useful. After those, it’s easier to concentrate on the message of the current annual shareholder letter as the reader is already up to speed on the context. When an investor reads a letter that talks about what a fabulous year a company had in conjunction with an underperforming share price, the prospective investor may stop doing additional research. If a management team thinks underperforming the market indicates a great job, they are either being dishonest or not incentivized enough by their own share price. It’s fine to underperform in a year—there are certainly acceptable reasons for this, particularly if it’s in support of future long-term goals; however, not addressing underperformance seems dishonest. Furthermore, it’s important to discuss true underlying results and appropriate benchmarks—not just those that relay results in the most positive light (e.g., revenue including an acquisition, non-GAAP numbers only). Standard Motor Products goes to painstaking lengths in its 2016 sharesholder letter to explain the true underlying financial performance of the company, stripping out many one-time items and acquisitions that would otherwise inflate results. The importance of candor is clearly shown in Figure 7 through a simple analysis of the Rittenhouse Candor & Culture rankings of four banks from 2002-2012: Wells Fargo, Bank of America, Wachovia and Merrill Lynch. Wells Fargo’s ranking remained consistently at the top and while Bank of America’s was lower, it was still in the middle of the pack back during the financial crisis. 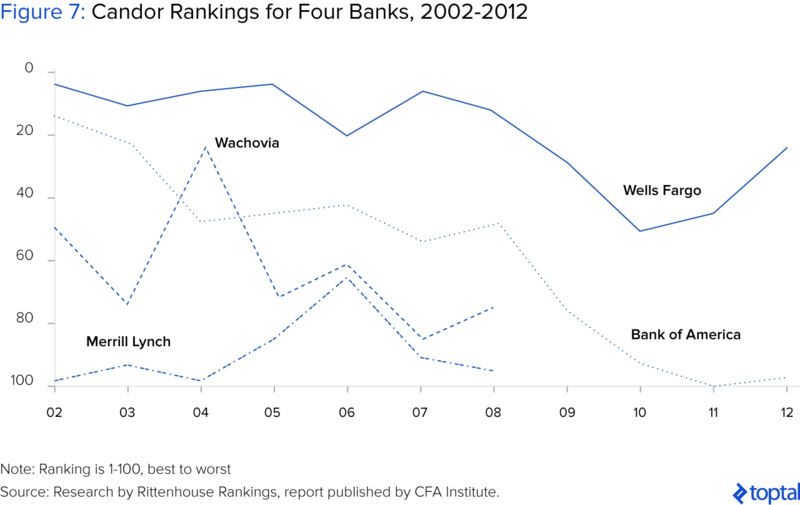 Those whose Candor & Culture rankings were the lowest—Wachovia and Merrill Lynch—did not survive the economic crisis. Tell the reader about the secular drivers in the company’s market or something insightful that is happening in the industry. At the very least, management teams should want the investor to walk away from the letter more informed about its industry and company. Explain any terms that are not immediately known to a non-finance expert. Warren Buffett considers his sisters when writing his letters—they are smart, they read a lot, and they invest their money, but they don’t marinate in finance terms all day. Make it easy to invest in the company by weaving a story. Verbally, an analyst has about 60 seconds (if that, according to a study from Microsoft) to get a portfolio manager’s attention and the same is true for a retail investor trying to convince a spouse. The easier a management team makes it to retell an investment thesis, the better institutional salespeople will retell the story, the more analysts will pitch to their portfolio managers, and the more retail investors will pitch to their friends at dinner. Ideally, a stock pitch or investment thesis includes: how the company makes money, what the drivers of the stock are, the risks, and a nod to valuation. However, a great stock pitch is different to every person so it’s imperative that a company pitch their story to their ideal investor. If a company boasts about beating consensus earnings every quarter, this attracts a shareholder base that will expect that to continue. If a company consistently talks about long-term goals, their investor base will likely be less concerned with quarterly fluctuations. Standard Motors, an auto components company, boils down two exogenous growth drivers it’s seeing within its industry (demographics, electronification of vehicles) and then lists Standard Motors’ own strategic initiatives to capitalize on this environment. Inogen, a healthcare equipment company, concisely conveys a tenet of the investment thesis. It is not extraordinary, but it’s very useful. “The latest data from 2015 indicates that domestic market penetration of portable oxygen concentrators in the Medicare oxygen therapy market is approximately 8%. Despite the benefits that portable oxygen concentrators offer to patients and providers, the market remains under-penetrated.” Now the reader knows the company has a natural tailwind at its back from a market with low penetration of the company’s product. This may seem like asking for too much, but think about the best letters you do read—Buffett’s folksy, self-deprecating writing style or Bezos’ out-of-the-box managerial insights make the letters readable because they are so interesting. That is entertaining. Providing entertainment in a shareholder letter is a wildly low bar too. Try not to start off with numbers. When using numbers, use them sparingly. Stay away from jargon. Say something different. Start out with an anecdote. Start with a quote. Start with a simple but relevant idea discovered on the treadmill. By far, the most entertaining letters possess all the traits listed above (define the company, tell a story, be candid, educate) but when that was all done in a compelling and plainly written way—free of jargon and meaningless corporate phrases—those were truly a joy to read. The letter that did this the best in the S&P SmallCap 600 Index was Biglari. The Biglari shareholder letter was a masterpiece. It’s very different. It’s very clear. And it introduces ways the CEO thinks about his company that many have likely not considered before. Biglari Holdings – This one is a delight to read. Biglari is a conglomerate that owns restaurants, an insurance company, and Maxim magazine. They wouldn’t use the word conglomerate though—they prefer “a constellation of disparate businesses fused together by a common purpose. Think of Biglari Holdings as a museum of businesses. Our preference is to collect masterpieces, such as First Guard Insurance Company, an entrepreneurial success story. We are able to provide a permanent home whereby the business, its headquarters, and its personnel remain in place. In other words, we seek the absence of change.” This letter definitely stands out for being beautifully written and full of novel ways to think about a company. Allegiant Travel Company – For years, Allegiant has offered flights from markets with small populations to leisure destinations (Las Vegas, Orlando) for a very low price thanks to its low cost aircraft—MD-80s that were ~20 years old—and ancillary revenues which supplemented low base fares. In this year’s shareholder letter, Maurice J. Gallagher, Chairman and CEO, does not tiptoe around the fact that this strategy must change due to its aging aircraft. He clearly lays out the tough transition ahead as the company must finally upgrade its aircraft. “The next few years will see an increase in our costs and a slowing of our annual growth rate while we transition to an all Airbus fleet. However, once the transition is completed, we will return to our ultra-low cost structure critical to our success.” Gallagher also writes a section clearly explaining what is causing the labor shortage in the airline industry. Acadia Realty Trust – When the broader issues of an industry in trouble are not addressed, it can lead investors to think that management has their heads in the sand. The CEO of this REIT clearly describes the backdrop and what specifically has led us to the currently fraught retail environment—from Amazon to fast fashion—and details how his company will come out stronger on the other side. The “new retail” world seems to agree with him as formerly online-only companies like Warby Parker and Bonobos are clients. Additionally, the CEO reminds investors that Acadia suffered through a really tough retail environment 1999-2001 and survived it—a quick history lesson provides welcome comfort. Dime Community Bank – Dime’s 2016 shareholder letter shows a great deal of self-awareness which is often difficult for CEOs to write about given their obvious proximity to the company. Dime, however, explains its underperformance relative to other banks in a candid, forthright way and seeks to address some misperceptions. “As might be expected from the recent regulatory emphasis, although Dime’s stock price gained 15% in 2016, it appears to have underperformed relative to sector multiples on price-to-book value and price-to-earnings bases. Could there have been a perception that Dime’s growth might be inhibited by its steep CRE concentration?” From here, the letter addresses a few other possible reasons for underperformance and argues why investors should re-evaluate. Strayer Education – Strayer’s management team is the best in what has been a challenging and often questioned industry. This is a management team that is prudent and thoughtful, and it shows in their investor letters. Strayer also does an excellent job explaining who they are, where they came from, and what their vision is going forward. Waddell and Reed – Curious about what has been going on in asset management? This letter lays out the reasons behind the mass exodus from active to passive investing and why this tide may begin to turn. Waddell asserts that low growth, low inflation, and low interest rates have led to a high correlation of assets, which has proved a difficult backdrop for active managers. With the Federal Reserve indicating that it intended to raise interest rates at a measured pace in 2017, the possibility for higher dispersion among asset categories would arise, and therefore, so would the stage be set for improved active manager performance. Thus far in 2017, these predictions appear to be coming true. From the Rittenhouse study, the Standard & Poor’s study, and my own study, we can be pretty comfortable accepting the fact that shareholder letters impact stock price. Best of all, adding this to my Equity Research Investment Process Checklist only tacked on about five minutes to the overall week-long process I usually undertake. Reviewing a Middle of the Pack letter takes about two minutes usually—you see a couple corporate jargon phrases and can pretty much skim the rest. A good chunk of companies won’t even have a letter. And the truly great letters could actually save you time in the long run. Who doesn’t want to save time and make better investments? What is a small cap company? The exact definition of a small cap stock varies; however, it is generally a term used to classify companies with a market capitalization of between $300 million and $2 billion. What is the job of a research analyst? An equity research analyst is generally someone who works at an investment bank (the “sell-side”) and analyzes the financial information and trends of a company or industry. The research conducted by the analyst is meant to help investors make knowledgeable investment decisions. What should be included in the annual report? The annual report is used by most public companies to disclose corporate information to their shareholders. It is usually a state-of-the-company report, including an opening letter from the CEO, financial data, results of operations, market segment information, new product plans, and R&D activities. Completely agree regarding the value of good annual letters (to both the reader and the writer). Thanks for the great post! Really interesting and helpful post. Thank you. Seems to me these concepts apply equally well to private company CEO's as well. Really great piece and not surprised that quality of shareholder letters seem to translate into success of business. Great point. These tips definitely apply to private company communication as well. Well done! This is an informative and insightful article on assessing the current and potential performance of a company. It was also an excellent tutorial on the basics on how to go about it. I would be happy to refer you to potential customers. Great write up! Most management teams really miss the opportunity to connect with shareholders via the shareholder letter format. Communicating change, challenges and opportunities in a jargon-free manner can go a long way re-calibrating investor relations strategy. Thanks Saud! Make sure to read Biglari - as a research analyst, I know you'll appreciate it. Thanks so much, appreciate the feedback! Thanks! Rittenhouse's study is super interesting also...they have been doing a similar study for the past decade for the same 100 companies which shows that better communication = better stock performance. Fantastic read. Especially the part "... companies do not go broke because they run out of earnings but because they run out of cash." http://www.boothwm.com/our-services/hab-housing How can we get traction on this socially responsible covered bond yielding a net 4.5% after regulatory costs of 0.3%?